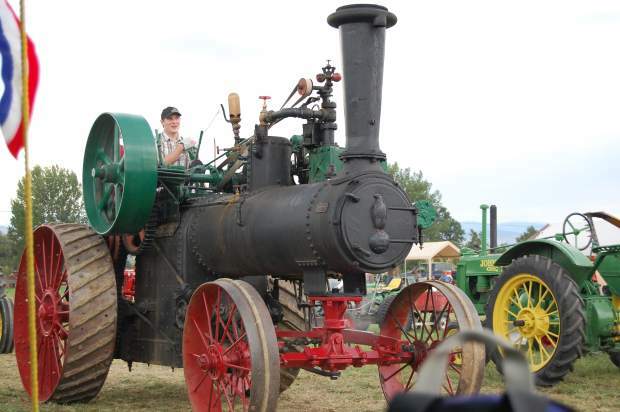 The annual Yesteryear Farm Show at Longmont, Colorado will be held Friday, August 24th through Sunday, August 26th, at the Dougherty Museum just south of Longmont on US Hwy 287. Antique tractors, antique farm machinery, antique cars and trucks, antique military equipment, stationary engines, steam traction engines, threshing demonstrations, baling demonstrations, blacksmithing demonstrations, collections of old tools and gadgets of all sorts, tractor parades, spinning and weaving demonstrations (provided by the Handweaver’s Guild of Boulder), as well as square dancing (by Calico and Boots – a square dance exhibition team.) There will also be scale model hand-made functioning engines – some built from kits, some built entirely from scratch. We always have on hand a very diverse assortment of items and skilled demonstrations – some relating to agriculture, and some not. We’ve had antique restored wooden fishing boats, a giant wooden waterwheel from an old mill in New England (I don’t know how it happened to end up here), radial aircraft engines, rope making machines, barrel making demonstrations, displays of antique washing machines, grinders, corn shellers, churns, etc., etc.! There is always something going on for you to see. Attending the Yesteryear Farm Show is an excellent opportunity for those who have little awareness of late 19th and early 20th century rural life to see what it was all about, and for those who were “there” and lived this lifestyle, it’s an opportunity to reminisce. We think you’ll all enjoy a visit to our show. The Yesteryear Farm Show is a free event provided entirely by volunteers, and to raise funds for this event, we conduct an auction of donated items during the show. The auction is primarily antique and farm-related, and is open to all bidders. There are no buyer’s fees, and all proceeds from the auction go to the Yesteryear Farm Show. Two highlights of this year’s auction are a restored 1945 Case Model VAC tractor that runs nicely and has brand new tires all around, and a beautiful, fairly large (five feet tall) freshly restored pot belly stove made by “St. Clair Stoves and Ranges”. It looks like new! The tractor was restored by the Yesteryear committee and the stove was restored by Jerry Dittrich of Longmont, CO. The auction will take place at 4:00 pm, Saturday, August 25th. Again, the only cost to you is your time – the Yesteryear Farm Show is free to all, and we encourage all of you who have antique items you’d like to display to come join in, too. Bring your items and enjoy showing them off! If you want to attend just to see all the displays and demonstrations, that’s fine, too! And while you’re here, you’ll want to save some time to tour the Dougherty Museum, which is adjacent to our show. The Dougherty Museum has a fantastic assortment of agricultural items as well as automobiles, buggies, musical instruments, phonographs, etc. Setup of equipment and displays will begin several days prior to the show, but overnight security coverage will not be provided until Tuesday evening, August 21. Security coverage continues through Sunday evening, August 26th. No alcohol allowed. The Yesteryear Farm Show will not be responsible for theft or accident. Free primitive camping is available to exhibitors. Food and refreshments are available. We hope to see you there! For more information, contact Harvey Nelson at (303) 776-5171 or Dave Brown at (303) 776-9859.